Benvenuti nel nostro 2 camere da letto, 1 1/2 bagno a casa in una tranquilla strada residenziale. Si prega di notare che il periodo di noleggio minimo è di 30 giorni. Questa casa è stata appena rinnovata, e ha nuovi pavimenti in vinile, nuova vernice, nuovi elettrodomestici inox in cucina, tra cui 2 piccoli forni aggiuntivi e un nuovissimo bagno di servizio nella lavanderia. Non appena tiri su, sei accolto con viste d'acqua dal posto auto coperto, e questo porta dentro. Il concetto aperto consente di vedere l'acqua da quasi tutte le stanze. Questa casa è completamente accessibile ai disabili, tra cui una grande rampa per sedie a rotelle per entrare in casa. La casa si affaccia ad est e si trova su un terreno di 1,2 acri sul lungomare senza ostacoli. Il bagno e la cucina sono stati rinnovati di recente, le camere da letto hanno entrambi materassi temperpedic, e c'è una lavatrice e asciugatrice frontale. La cucina è completamente attrezzata C'è un divano letto singolo nella sala TV / den. C'è una combinazione soggiorno / sala da pranzo, una sala TV / den, grande dispensa con lavatrice / asciugatrice e 1/2 bagno. Sul retro della casa di fronte all'acqua è una grande veranda con tavolo, divano, divano e sedia, un luogo ideale per trascorrere il tempo a guardare l'acqua. Wishing for some therapeutic time to unwind, my wife and I were seeking to vacation someplace different this year. We both knew that there must exist a place far from the hustle and bustle of dreadful commutes. For us, genuine hellos and simple waves were needed to replace rushing pedestrians and overbearing salespersons. Our allocations of overly dramatized news cycles had reached their peak. My desires were to swap the past eleven months for four weeks on a pair of his and hers Schwinn bicycles. After searching online for an out-of-the-way, water oriented community, I believed that the unhurried pace of Cedar Key might suit us well. It was a bit far from home, but otherwise, we thought it fitting. About an hour Southwest of Gainesville and three roadkills later, Hansel was busily scanning the next horizon for a necessary rest stop, and Gretel was whispering hints that someone’s directional skills could possibly use a bit of updating. Despite the restless aire, we pressed on. Sensing “the look”, I could almost guess the next question was about to be, ...“Seeing what I’m seeing, might there be a possibility the last half hour here is just another one of your legendary shortcuts”? Then, the scrub palm and pine transformed itself into a welcoming vista. Almost simultaneously, the two of us changed from uneasiness to enthusiasm. Our conversations now centered on the warming weather and the scenery beforehand. Talk of work, chores and politics was verboten. About a mile from town center, we located Mrs. Stevens’ home. It sits on a picturesque lot on the water. There are several mossy oak which provide nicely shaded areas throughout the yard. The dock is peaceful and offers itself as a welcoming place to read or cast a line. Time here is told by the tide. Near high water and with some luck small redfish, perch and catfish will appreciate your offerings. The photographs posted do accurately reflect the charm, cleanliness, and spaciousness of Mrs. Stevens’ home. Newer stainless appliances compliment the open kitchen and make cooking fairly effortless. Any utensil desired can be readily located. There are big pots, little ones, dishes and silverware galore. You’ll find all rooms are freshly painted in soothing colors. Bright crown moldings at every ceiling add just character. The porch was utterly perfect. Go if you can. Grab a sunset cruise; rent a golf cart; dine on fresh seafood; decompress. The sunrises are truly spectacular. This gem has been polished. We did return to Cedar Key and, as we said we would, we chose to stay at this home again. (See our review from January 2017). Everything we stated in that review remains accurate. However, since that stay the owners have done a lovely job of giving the interior a facelift with fresh new paint and excellent vinyl flooring throughout; they have also renovated the laundry room, converting what was a large cupboard into a neat and convenient half-bath. Going beyond these changes, new stainless steel appliances have been installed in what was already an excellent kitchen and the bathroom has also benefitted from some new additions. The skylights over the kitchen and living room are terrific, allowing in so much light that sometimes we thought we'd neglected to turn lights off. Our favourite place in the home is still the wonderful screened-in, multi-windowed sunroom from which wonderful views are always present: sunrises are spectacular; multitudes of birds to watch; kayakers paddling about; always changing light for endless photo ops, and; a shifting environment with the ebb and flow of the tide. We never tired of, nor took for granted, the views offered from this home. Even when sitting inside, or working in the kitchen, a glance out is invariably an, "Oh, look," experience. There are lots of activities in this community during March. Once again we cycled frequently and were impressed with how cyclist friendly drivers are. We highly recommend this home as a place to stay in Cedar Key. The photo of the exterior of the home does not do the interior justice so don't judge this book by its cover; it's a lovely home. This was our second month-long rental in Cedar Key and although our first one was also lovely, if we were to return to Cedar Key, it would be to this one. The house is as described. It is very well appointed and all of the furnishings are comfortable including chairs, rockers, porch furniture, and bed. As a previous reviewer noted, the kitchen is a cook’s dream. There is an amazing assortment of knives and they are sharp (first time ever in a rental). There are good, clean cutting boards, measuring cups and spoons, clean can opener (also rare), and an excellent set of pots and pans. Everything one might need is available in this kitchen. The scene from the screened-in porch overlooking the tidal flats is ever-changing and always interesting even when there is fog. The porch is ideal for viewing sunrises and birdlife. It is like sitting in your own comfortable personal bird blind. Bring your binoculars. We spent most of our time on the porch, including having our meals, as long as it was warm enough. When it wasn't warm, the heating system in the house was efficient. The neighbourhood is very quiet and this rental is on a corner waterfront lot. Perfect. It's a good area to cycle around if you bring your own bikes. It's a pleasant ride to Cemetery Point, to the airport; an easy ride into the town area. Cedar Key is impressively cyclist. The owner responded promptly to every question and was most accommodating. We definitely recommend this home to anyone looking for a comfortable, peaceful place to stay. We had the time of our life in Cedar Key at the Stevens House. The house is very spacious and oriented to make the most of the wonderful sunny Cedar Key mornings. In February we were well comforted by the heating system on a couple of nights. During the warmer days the wonderful ceiling fans kept us pleasantly cool. The kitchen is indeed, very well equipped and well lighted. It was especially nice to have the ice maker and the dishwasher when we had guests for the wonderful seafood dinners we prepared. The house is modestly appointed, delightfully pleasant and extremely functional. 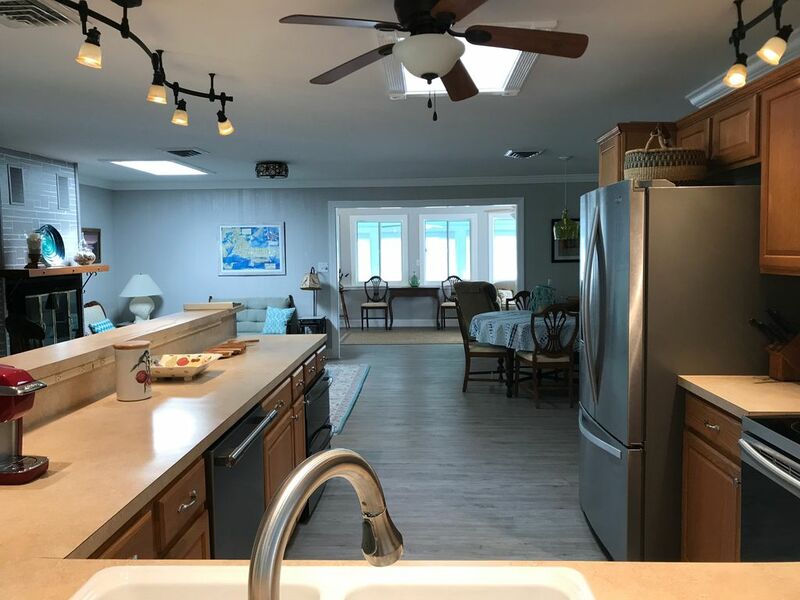 We really appreciated the numerous additions and upgrades (instant hot water, internet, dish network, spacious porches, car port and workrooms, dishwasher, washer and dryer). Fishing off the dock, launching our kayaks from the yard and the addition of the bicycles for our use were extras we made use of every day. The neighborhood is quiet, but friendly and the pace is easy going. Walking to the State Park around the block (where John Muir stayed for a time), watching the bald eagle pair at the corner, the dolphins that occasioned the bay and kayaking to Atsena Otie were special treats for us. Everyday bird watching included egrets, herons, ibis, two varieties of pelican and a flock of roseate spoonbills. Cedar Key is a special place and the Stevens House is a wonderful welcoming way to let the magic unfold. We were graciously permitted to have an irregular rental period that extended our stay and enabled us to take care of our grandchildren (due to their vacation schedule). We look forward to returning and working with Maryjane was a dream. What a lovely house! It is a very spacious home with nice furnishings. My favorite spots were the kitchen which is fully stocked and lots of space for those of us who like to cook. There were pots and all kinds of utensils for some serious seafood cooking, ie oysters, crabs and fish. It was great. My other favorite spot was the enclosed porch that looked out on the bay. There were comfortable chairs and tables for lounging and eating. We watched diver ducks, egrets, cranes, etc. cruise through the area in front of our porch. In addition there is a nice barbeque grill. Our only negative with Cedar Key was the weather. It was February and very cool and windy. It got down to 28 degrees one morning! However, the heating system worked very well. This is a remote island with lots of bird life and wildlife refuges nearby. Very quiet island. We only ate out once in the town which was not a good experience. It is at least 30 miles to the nearest town with shopping. If you are looking for a quiet retreat, then this is it. My husband wanted to come here for the fishing. He struggled with the weather, but when it was good, the fishing was good as well! All in all we had a great experience with this property and the owner. Maryjane was quite responsive when contacted. We didn't really have any needs or problems with the house that required her help. We would rent from her again and definitely recommend this property for renting. Minimum rental period is 30 days.